Mid way into the winters and we start seeing these gorgeous Cape gooseberries (rasbhari in Hindi) in Delhi and almost all over the north India. 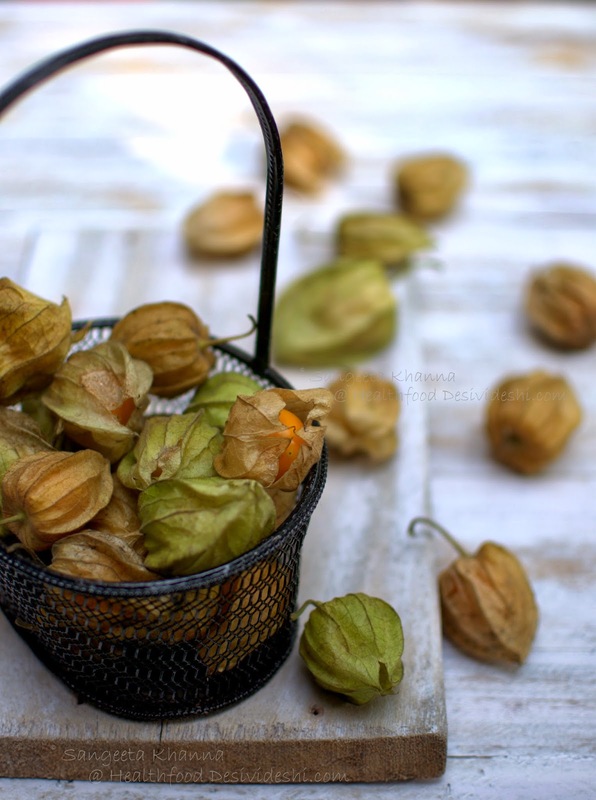 One of my favourite fruits since childhood and I remember someone had Cape gooseberries growing in their kitchen garden in our neighborhood when I was just about 3-4 years old. This was in Nainital and I still remember how it smelled around that garden and how I loved it. Even now that memory knocks at the back of my head whenever I get the whiff of this fruit in our markets. So full of flavours and aromatic in it's own way. I make jams and salads mostly whenever I am not eating the fruit right from it's papery envelop. The high pectin content makes this berry highly suitable for jams and preserves and makes it rich in Calcium as well. 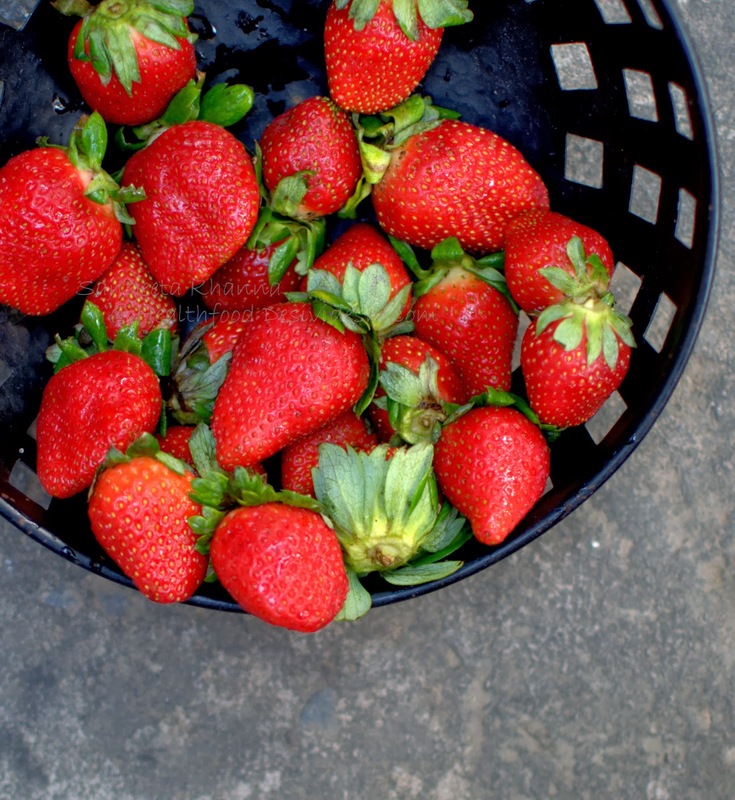 Around the same time strawberries also make a flushing appearance in the markets and black grapes become more and more plump and abundant too. I often mix them all along with pineapple cubes to make my fruit salads, the sole reason being I buy too much of these on my weekly fruits and vegetables shopping day. 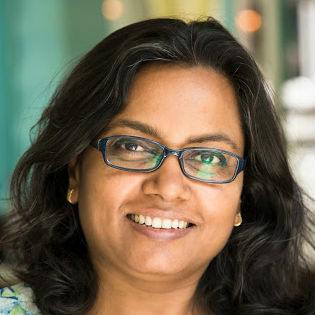 Thursdays are the days when a nice farmer's market style market is heal here in my locality and I never miss a chance. I love how the juices of all these fruits make a fresh tangy cocktail and feels tingling even without a dressing.This salad is a real boost of antioxidants and that too in a yummy way. No one can resist this salad even if you add a few bits of raw greens and may be a few cubes of guava as well. You can add cubes of pineapple, guava etc too as they belong to the same sweet and tart family of flavours. 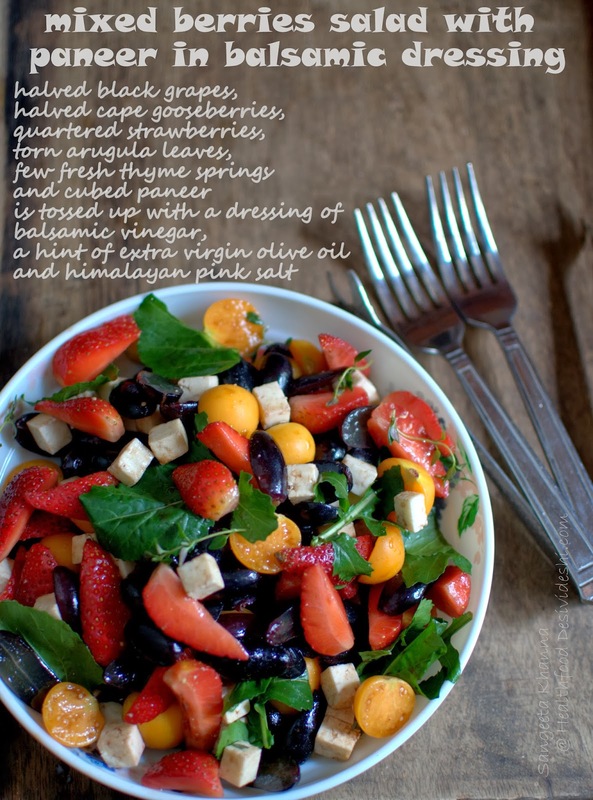 Mint leaves work really well with this salad too so use them if you have them at hand. Mix a few leaves of spinach too if you are growing them yourselves. 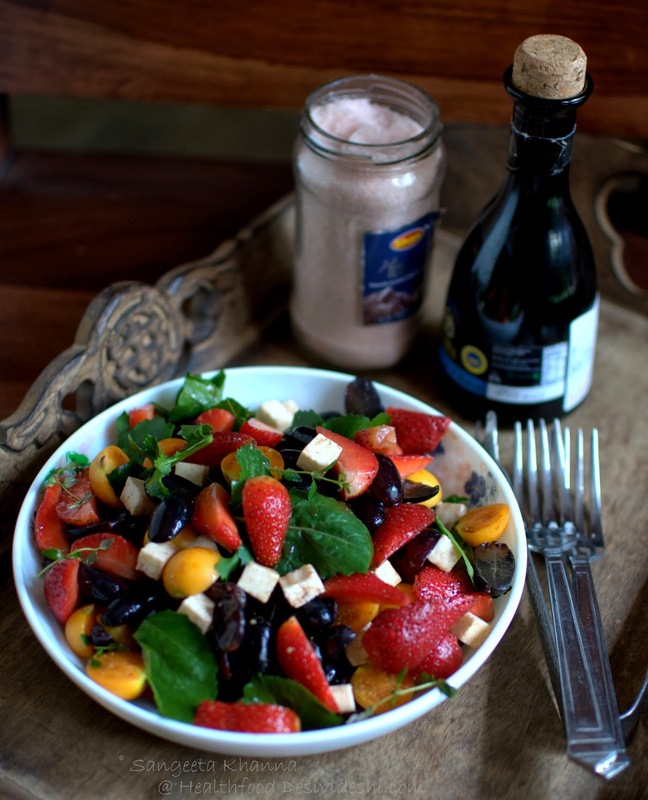 Replace paneer with fresh mozarella if you feel fancy but I just love the way paneer soaks up the juices in the salad. All the juices of these berries make a really nice cocktail with balsamic vinegar and feel fresh and wholesome. I make this jam with cape gooseberries and ginger almost every year and this jar of jam is actually from my last year's abundance of rasbhari. I had made some extra to gift someone and probably forgot. Now that half of the jar is over, I have to make it again before the rasbhari vanishes from the markets. 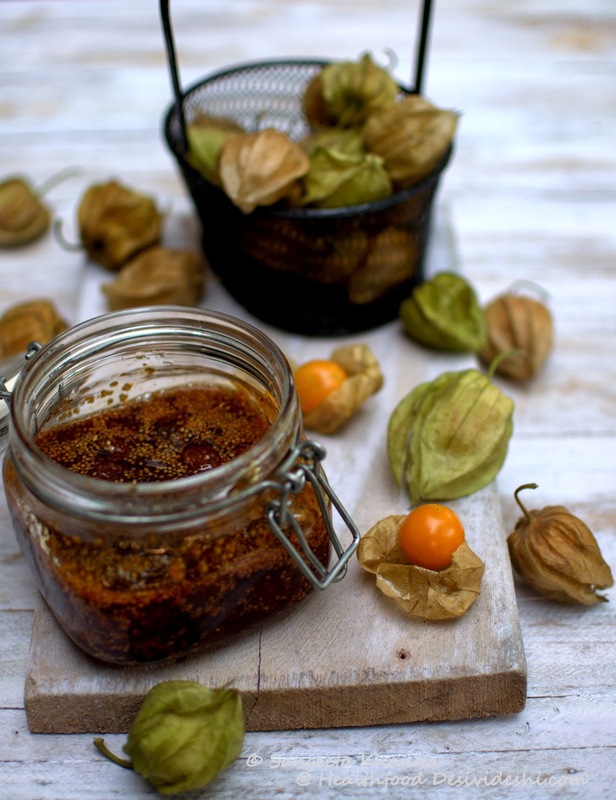 To make this rasbhari or cape gooseberry jam with ginger, clean and chop the berries in quarters and measure them. To each cup of chopped berry, add half a cup of sugar and 1 heaped tbsp of grated ginger (more or less according to taste) and put them all together in a deep pan along with 2-3 tbsp water per cup of berries. Cook on medium heat till the mixture starts thickening and looks shiny. At this stage you see a very pleasant bubbling that indicates the sugar syrup has now gelled the pectin. You can test the jam by dropping it on a clean plate and keeping it in the freezer for 30 seconds. The gelling indicates the jam is done. Transfer the ready jam in sterilised jars immediately, let it cool and then cover the jars. This jam keeps well for the whole year at room temperature. I sometimes add a hint of red chilly powder to it and that takes this jam into the chutney territory. Do it the way you like it. it's been so long since I ate rasbhari...jam idea sound delicious....love this salad, can eat it anytime. You are really so creative, cant wait to try this jam.